At Niki Farms we practice organic farming. 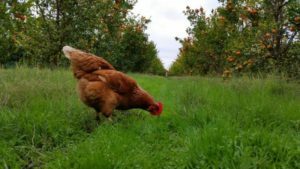 Our hens are out all day in our organic pasture/mandarin orchard. We are certified 100% organic by CCOF and registered as an egg handler with the State of California. We are ever striving to ensure safe, nutritious food, which you can see for yourself when you come by to pick up your eggs and do a farm tour.